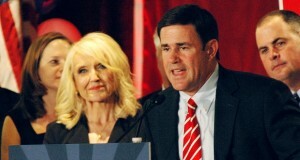 Outnumbered and out-financed in the land of Barry Goldwater, Democrats often trade with the currency of hope. But even hope quickly collapsed under the weight of mathematical reality on Nov. 4, when Republicans swept statewide races in victory after victory. The success mirrored the party’s triumph at the national level, where the GOP expanded its dominance in the U.S. House and seized control of the U.S. Senate. Many Republicans celebrating last night (Nov. 4) already had accurate measurements of the Governor’s Office windows, with key cabinet positions all but guaranteed for some. Doug Ducey won Arizona’s first wide-open gubernatorial race in 12 years, cruising to election as the state’s 23rd governor. 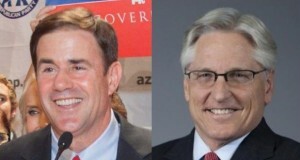 The Republican and Democratic candidates for Arizona governor are making a final campaign push through the state as they try to seal a general election win and their parties pull out all the stops to get voters to the polls. 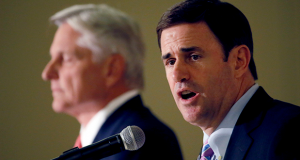 The race for Arizona governor has created an odd mix of arguments in a state where recent gubernatorial contests were dominated by divisive issues like immigration. The shift away from hardline rhetoric and toward more nuanced positions marks an effort by both candidates to negate their opponents' key points as they court the growing bloc of independent voters in Arizona. Following several days of fierce Republican criticism over his opposition to laws requiring parental consent for minors who are seeking abortions, Democratic gubernatorial nominee Fred DuVal said he wouldn’t attempt to change those laws if he’s elected governor.